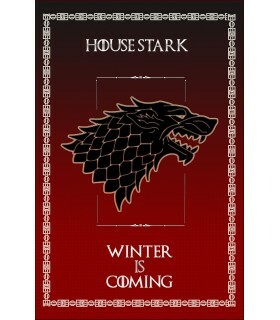 Banners Game of Thrones There are 12 products. 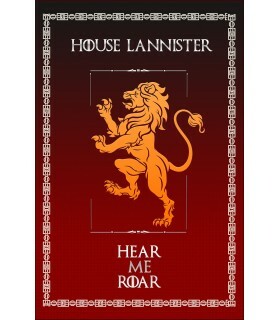 Banner Game of Thrones House Baratheon with 4 ribbons of fabric on the ends for tying. 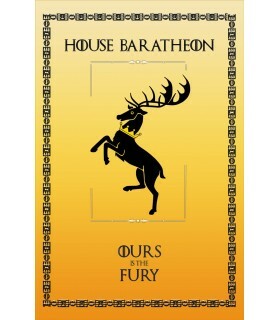 The house of Baratheon is one of the larger houses of Westeros, and is the main house of the Bastion of Storms, and who rule as Lords of the Authority. Its seat is an old castle built by the Kings of the Storms of the now-defunct House Durrandon. 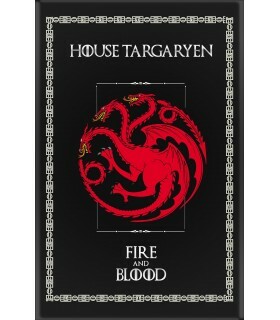 Banner Game of Thrones House GreyJoy with 4 ribbons of fabric on the ends for tying. The House GreyJoy is one of the noble families of Game of Thrones-inspired in the folklore and customs. His motto 'do Not sow'. Banner Game of Thrones House Clegane with 4 ribbons of fabric on the ends for tying. 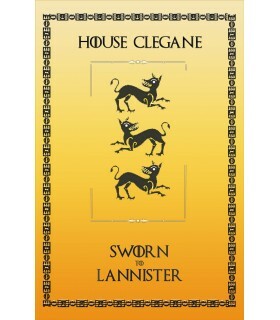 House Clegane of Game of Thrones is a house of the chivalry of the western lands and vassal of house Lannister. Banner Game of Thrones House Bolton with 4 ribbons of fabric on the ends for tying. 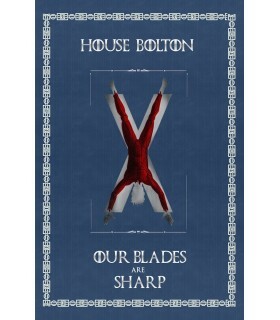 The house Bolton of Strong Terror, is an ancient house descended from the first men and the current ruler of the North. Their motto is 'Our swords are sharp'. Banner Game of Thrones House Martell with 4 ribbons of fabric on the ends for tying. 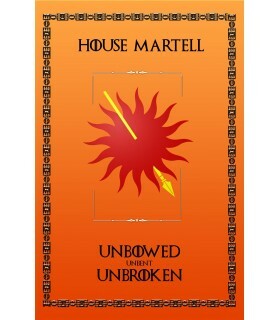 House Nymeros Martell of the spear of the sun is the house ruler of Dorne. Nymeros means the line of Nymeria. His emblem is a sun gules pierced by a spear of gold on an orange background. Banner Game of Thrones House Tully with 4 ribbons of fabric on the ends for tying. 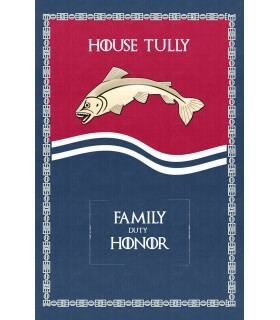 House Tully is one of the noble houses of the saga a song of ice and fire game of thrones. Its lineage dates back to the Age of the Heroes. Your shield is in the field of waves with a trout of silver jumping. Banner Game of Thrones House Tyrell with 4 ribbons of fabric on the ends for tying. 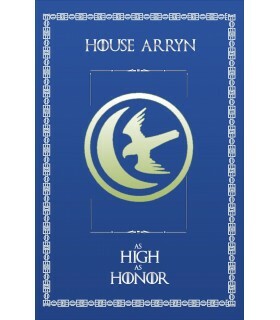 The house Tyrell of Altojardín is the house ruler of the domain. 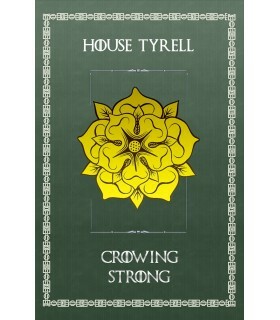 His emblem is a rose in gold on sinople field, and their motto is 'Grow Strong'. Banner Game of Thrones and House Mormont with 4 ribbons of fabric on the ends for tying. 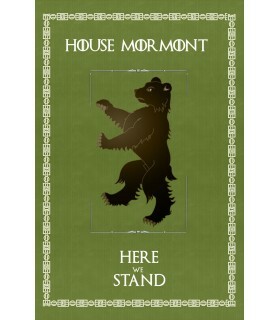 House Mormont of bear island is a noble house from the North settled in the island of the bear. Its emblem is a bear of sable lifted up on its hind legs on a wood vert. Their motto is 'Here, we Endure'.